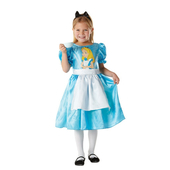 From the hit Disney movie comes our Kids Alice In Wonderland costume. This pretty costume includes a blue satin feel dress with a lace neckline and black button detailing. The dress also features printed woodland animals and flowers in black at the bottom of the dress.